Until now, inroads for Setanta Sports into the PC TV crowd have been stymied by the lack of decrypting hardware. Hauppauge has delivered a solution with the WinTV CI, a common interface module that takes CAMs and cards for satellite and terrestrial pay-TV services (except Sky) when used in conjunction with most recent Hauppauge satellite or DTT PC tuners. 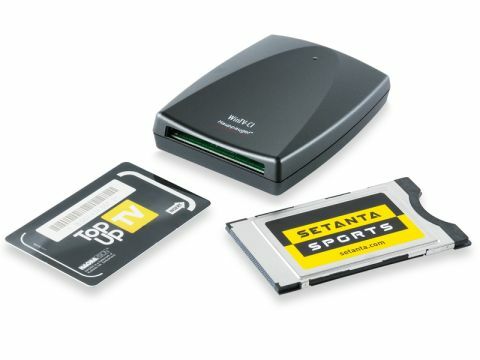 The two have paired to produce an upgrade pack for receiving Setanta's DTT service comprising the module, a Nagravision CAM and a Setanta Sports viewing card with connection fee and a month's subscription included. Sporting a single green power light, the module is a little bigger than an iPod Classic, and connects to your computer via a USB 2.0 port from which it draws its power. It can also be mains-powered, but a lead is not supplied. If you already have an Hauppauge TV tuner you simply slot the viewing card into the CAM, put the CAM into the module, plug the module into a USB port on your computer and install the necessary drivers and WinTV 6 viewing software. You then register the card with Setanta and you're ready to watch. Some online retailers throw a free Hauppauge PC stick into the bundle - such as the Hauppauge WinTV Nova-T used here, which comes supplied with a remote control and a less-than-reliable portable antenna (we favoured our rooftop aerial instead). WinTV 6 isn't the most attractive-looking application we've come across but the remote (which, along with the tuner stick, is compatible with Windows Media Center) makes operation relatively straightforward. Clicking on a row of icons situated alongside the currently showing programme on the top left gives you access to the main menu options and volume control. Keyboard shortcuts are also an option. You can opt to have the software always running on top of other applications, in 4:3, 16:9 or in in full-screen or in a choice of resolutions from 320 x 240 to 800 x 600. A seven-day EPG populated by DVB data is accessed via a separate application that works in conjunction with WinTV 6. This displays both TV and radio together as a timeline grid. Programme info is displayed and you can also schedule recordings (one channel at a time) in WinTV. Another application, WinTV scheduler can be used to set up once, daily and weekly recordings. Timeshifting or 'pausing live TV' is possible but only starts once you select pause, taking a few seconds to kick in. A second row of VCR-style buttons and a rather tiny progress bar is used for this. You can slow playback, speed it up and fast-forward and rewind at 2x or 8x normal speed. You can manually record by hitting the record button and recordings are captured in DVD-quality MPEG-2 and stored with their channel name. Cached material is automatically saved as a ﬁle labelled WinTVPause but this is overwritten the next time you decide to pause unless you move it from the designated folder. The Hauppauge Nova-T tuner generated rather soft pictures on the whole, whether on minor channels like Bid TV, Setanta Sports or BBC One or ITV - from which you'd expect more picture ﬁdelity. Channel-changing is also rather sluggish. Having a separate decoder unit and TV tuner is a little unwieldy for roaming laptop users and while you save a little getting started on Setanta, even if you already have a stick or get one free, the kit is twice the price of a standard Setanta-compatible receiver. That's quite an ask unless you plan to use the module in conjunction with a satellite PC tuner too. Still, those wanting an easy way to watch Setanta Sports on their computer pretty much get what they pay for.